When you were a child, your mother might have told you that carrots are a healthy food -- she was right. Packed with vitamins, minerals and dietary fiber, carrots make a perfect low-calorie snack, add color and flavor to salads and are a good side dish at dinner. Among their many benefits, carrots are good for your digestion, helping to keep your digestive organs working well and lowering your risk of intestinal and other problems. Carrots are rich in dietary fiber, a type of indigestible carbohydrate that's found in plant-based foods. Fiber comes in two forms, called soluble and insoluble, and carrots are a good source of both types. For example, a 1-cup serving of sliced, cooked carrots provides a total of about 3.5 grams of fiber, with approximately equal amounts of each type. Although it provides no nutrients, fiber plays an important role in digestive health. Healthy adults need between 20 and 30 grams of fiber daily for good health. The insoluble fiber in carrots helps move food through your digestive tract smoothly, adding bulk to your stool and helping prevent constipation. Insoluble fiber can also lower your risk of some digestive disorders. For example, experts at the Harvard School of Public Health say that a diet high in insoluble fiber could reduce your risk of an inflammatory disease of the intestine called diverticulitis by about 40 percent. Unlike insoluble fiber, soluble fiber in carrots forms a gel when it mixes with liquid in your stomach. It slows the digestive process, helping blood sugar and cholesterol rise slowly and gradually after a meal. This could lower your risk of type-2 diabetes and heart disease, according to information from Harvard. Carrots are especially rich in beta-carotene, a precursor of vitamin A, or retinol. Your body converts beta-carotene into active vitamin as it needs it. 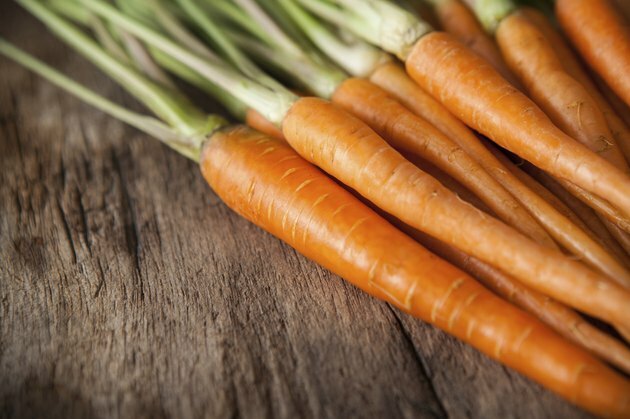 A 1-cup serving of raw, chopped carrots provides enough beta-carotene to produce slightly over 1,000 retinol activity units, which is slightly above the daily amount required for an adult male. Vitamin A is sometimes called the anti-infective vitamin because it boosts your immune system, supporting formation of immune cells called lymphocytes. These cells are found in tissues of the digestive tract and help fight off pathogens you might ingest with food. Vitamin A is also essential for maintenance of the lining of the digestive tract, which is the first line of defense between food-borne pathogens and the rest of your body. Carrots are also a good source of several essential minerals, including calcium and potassium, with a 1-cup serving of raw, chopped carrots providing about 40 milligrams of calcium and 400 milligrams of potassium. Both minerals are required for normal contraction of all types of muscle, including smooth or involuntary muscle, which is found in the wall of your stomach, intestines and colon. After you eat, rhythmic contractions of this muscle layer help move food through the digestive tract, so taking in sufficient quantities of these minerals is essential for good digestion. If you have questions about the potential benefits of carrots, talk to your doctor or to a registered dietitian.